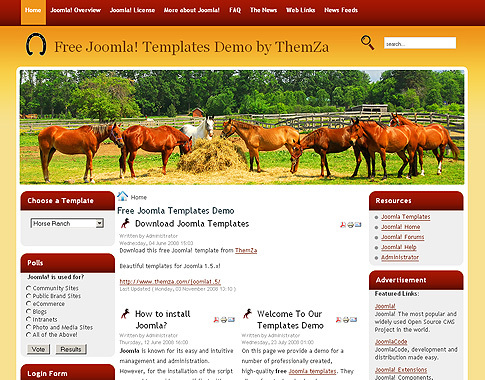 The long expected Horse Ranch Joomla 1.5 template is now online for you to download and use with pleasure. The theme supports a 3-column layout (including a 2-column body area plus right/left sidebars) and various color schemes – brown, green and red. It supports all the dynamic sidebar modules you’d find on a standards compliant Joomla 1.5 template. Enjoy! 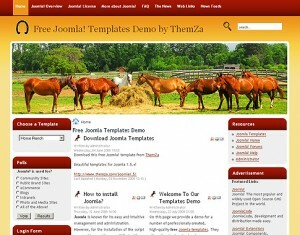 This entry was posted on Tuesday, January 25th, 2011 at 8:21 am	and is filed under Joomla 1.5.x. You can follow any responses to this entry through the RSS 2.0 feed. You can leave a response, or trackback from your own site.